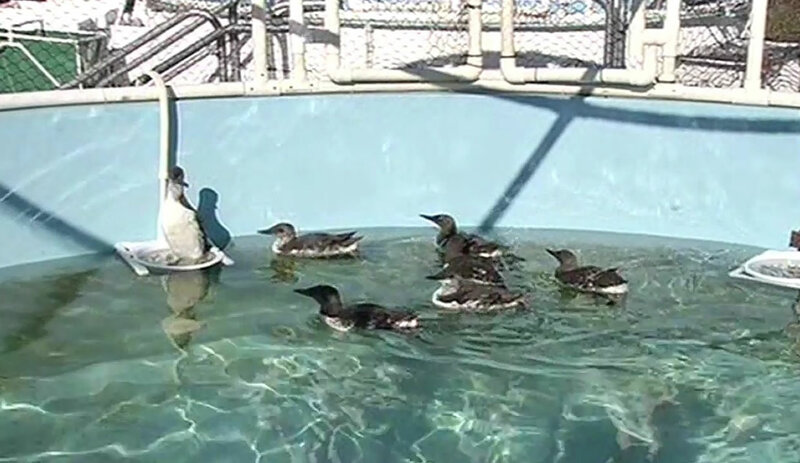 Bird rescue centers in the San Francisco Bay Area say they're getting inundated with murre sea birds and it is causing a lot of concern. RODEO BEACH, Calif. (KGO) -- An alarming number of dead or dying sea birds are washing up on Bay Area beaches and bird rescue centers say they're being inundated with a particular species. ABC7 News traveled to the Marin headlands where many of them are washing up. Beach goer Holly Barbarisi recently found 20 dead murre sea birds along Rodeo Beach on the Marin headlands. She also found one alive flapping in the surf. Barbarisi told ABC7 News, "And it was obviously disabled and unable to fend for itself, so I did take it into Wild Care." That bird and many other survivors are transferred to the International Bird Rescue Center in Fairfield. "We're getting generally between five and 15 a day," Michelle Bellizzi from the International Bird Rescue Center said. International Bird Rescue normally receives about 10 murres a year, but they currently have 45 of them recuperating there. "They're such fluffy little things. But when I put my hand on his stomach you can feel that he's got no muscle on his keel at all," Bellizzi pointed out. Most are young like the baby bird Bellizzi showed us, rescued on Dillon Beach at Point Reyes, on Tuesday. It's being fed a slurry of fish formula to help it regain its weight. The International Bird Rescue believes the fish are diving deeper because of warming water temperatures. "If those fish are just a little bit lower than those baby murres can dive for food, than we see lots of sick and dead and dying baby murres on the beach," Bellizzi said. If you find a sea bird in distress, the International Bird Rescue recommends that you throw a towel over it, wrap it up and gently place it in a well-ventilated box. You can take it to a wildlife rescue center that cares for birds or you can call your local Animal Control.